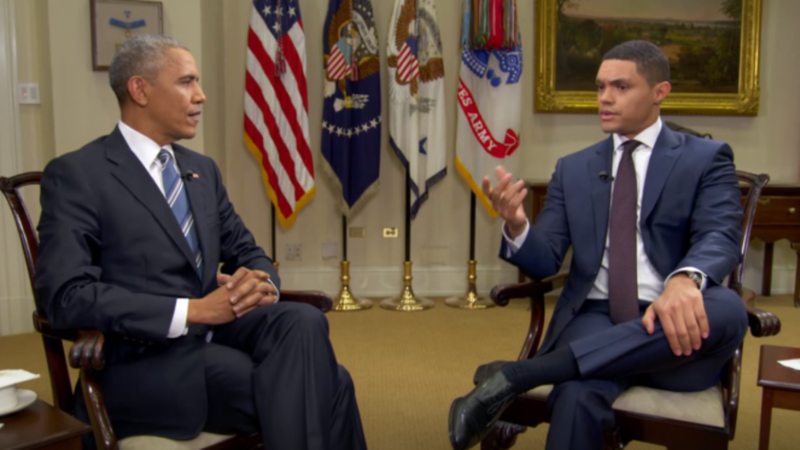 President Obama sat down with Trevor Noah and commented on Trump's upcoming presidency. When he’s not interviewing alt-right faves, Trevor Noah is speaking to people we actually want to hear from––like President Obama. On Monday night, Obama made his final appearance on The Daily Show before he leaves office, during which he low-key burned President-elect Trump, who recently explained that he did not need regular intelligence briefings. “I don’t have to be told — you know, I’m, like, a smart person. I don’t have to be told the same thing and the same words every single day for the next eight years. It could be eight years — but eight years. I don’t need that,” he said. The President also discussed the CIA’s report that Russia meddled in the election, explaining no one should be shocked. For Obama, the issue we should be concerned with is the reaction and controversy surrounding Hillary Clinton’s leaked emails. “The real question that I think we all have to reflect on is, what’s happened to our political system where some emails that were hacked and released ended up being the overwhelming story and the constant source of coverage, breathless coverage, that was depicted as somehow damning in all sorts of ways, when the truth of the matter was, it was fairly routine stuff,” he said. Watch the entire interview in the clip below.